Terry Wellner and Bob Allworth at MODULAR have applied a comprehensive approach to manufacturing a variety of innovative, environmentally responsible building designs since 1993. Each building is custom designed to meet owner’s requirements and address the peculiarities of the site. We use state of the art materials that are sustainable, recyclable, and with minimum maintenance, greatly extend the life of your buildings. Energy efficiency and minimizing condensation are of paramount concern. Panelized buildings take advantage of efficiencies available only from fabrication in a controlled, factory environment. Materials are ordered to length from steel with a high recycled content. Oriented strand board is manufactured from sustainable aspen forests, not old growth forests. 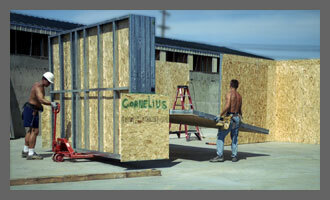 Our pre-fabricated buildings take less time to assemble in the field. The end result is a higher quality building at a cost that’s competitive with other building manufacturers. Better buildings, better value. Terry Wellner has two engineering degrees from the University of Portland, and has over thirty years of engineering and construction management experience. He has “done everything from neutrons to sawdust.” Terry has over fourteen years of self-storage experience and is a facility owner. Bob Allworth has a tech-school education and many years of construction experience. He began building walls in our shop and quickly advanced to project management. Bob enjoys meeting clients at their sites so he can gain perspective on how to best meet each customer’s unique needs. MODULAR'S building system is both an excellent packaged product and competitively priced. Thanks to your building system, we were able to complete assembly and start renting spaces 60 days ahead of schedule.